alaTest has collected and analyzed 193 reviews of Toshiba Camileo P100. The average rating for this product is 3.4/5, compared to an average rating of 4.0/5 for other Camcorders for all reviews. Views about the design and price are generally positive. The size and usability are also appreciated, but some have doubts about the zoom and reliability. We analyzed user and expert ratings, product age and more factors. Compared to other Camcorders the Toshiba Camileo P100 is awarded an overall alaScore™ of 78/100 = Good quality. 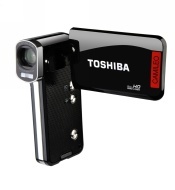 alaTest has collected and analyzed 36 user reviews of Toshiba Camileo P100 from Amazon.com. The average user rating for this product is 3.0/5, compared to an average user rating of 3.9/5 for other Camcorders on Amazon.com. People are impressed by the design and usability. The price and size are also appreciated. The zoom and reliability get negative opinions. 56% of the reviews on Amazon.com give this product a positive rating. The Toshiba Camileo P100 pistol-grip camcorder packs plenty of features, but can it shoot down the competition? Pros: Great features! Amazing idea behind the product!Cons: slow motion over pixalated. Unit freezes without notice. Lost files.